Digitization help student to explore and study their academic courses online, as this gives them flexibility and scheduling their learning at their convenience. 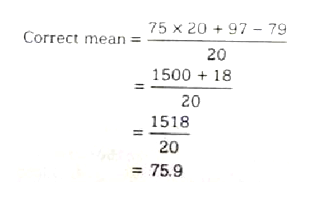 Kidsfront has prepared unique course material of ELEMENTARY MATHEMATICS Profit Loss Partnership for CDS Exam student. 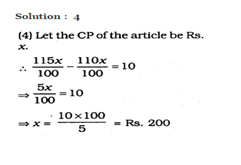 This free online ELEMENTARY MATHEMATICS study material for CDS Exam will help students in learning and doing practice on Profit Loss Partnership topic of CDS Exam ELEMENTARY MATHEMATICS. The study material on Profit Loss Partnership, help CDS Exam ELEMENTARY MATHEMATICS students to learn every aspect of Profit Loss Partnership and prepare themselves for exams by doing online test exercise for Profit Loss Partnership, as their study progresses in class. Kidsfront provide unique pattern of learning ELEMENTARY MATHEMATICS with free online comprehensive study material and loads of CDS Exam ELEMENTARY MATHEMATICS Profit Loss Partnership exercise prepared by the highly professionals team. 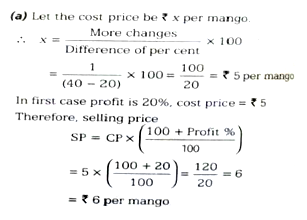 Students can understand Profit Loss Partnership concept easily and consolidate their learning by doing practice test on Profit Loss Partnership regularly till they excel in ELEMENTARY MATHEMATICS Profit Loss Partnership. Sonu and his friend Rahul went for shopping. Sonu had Rs. 550 with him Q.While Rahul had Rs. 240. Sonu spent twice as much as Rahul on shopping. Now Sonu has three times as much money as is left with Rahul. How much money did Sonu spend ? Solution Is : Sonu spent Rs. 440. A man bought 20 dozen eggs for Rs. 720. What should be the selling price of each egg if he wants to make a profit of 20% ? The value of an equipment depreciates by 20% each year. How much less will the value of the equipment be after 3 years ? A watch passes through three hands and each gains 25 % . If the third sells it for RS 250 , What did the first pay for ? I sold a book at a profit of 7 % . Had I sold it for Rs. 7.50 more, 22% would have been gained . Find the cost price .